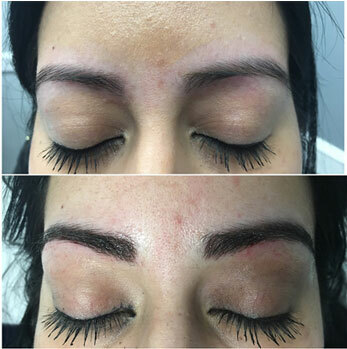 Microblading is a unique process where pigment that matches your existing eyebrow color is applied to the skin in gentle strokes so that it mimics the look of natural hair. Since the pigment is placed into the epidermis, it is considered semi-permanent while you will have the look of fuller eyebrows without the use of shading products or makeup pencils that need to be reapplied daily. Microblading can typically last for 1 to 3 years. This procedure is ideal for people who want to have fuller eyebrows, or for people who suffer with hair loss from medical or genetic conditions such as trichotillomania or alopecia. When you arrive for your first appointment, we will speak with you regarding the design of the eyebrows so you have the look you desire. Our trained technicians will apply a topical product to numb the area. Then using a pencil-like tool, we will manually apply the pigment to the upper part of the skin in the eyebrow region. Your eyebrows will normally appear darker after the first application due to the healing process. After the initial work, we will perform a follow-up in a few days to further touch up the eyebrow design. 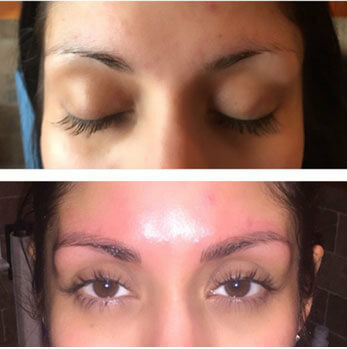 The process can take anywhere from 60 minutes to a few hours depending on your skin type and how it responds to the microblading technique. Based on how much your skin absorbs the applied pigment, we recommend periodic touch-ups every 6 months to a year. 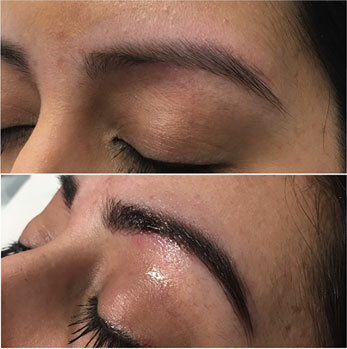 This semi-permanent technique of microblading offered by Metropolitan Vein and Aesthetic Center can allow you to have the eyebrows you always wanted with more lasting results.